The loin ribbon without the backbone, but with a piece of rib stick. 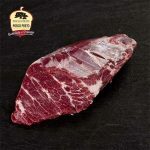 The combination of firm texture, high degree of infiltration and its content in oleic acid make this piece offer intense flavours and great juiciness. Its presentation in both fried and roasted enjoys great acceptance. 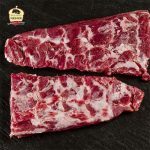 This piece is particularly rich in intramuscular fat, which gives it a great tenderness and juiciness. Its high concentration of monounsaturated fatty acids (oleic acid) will generate a characteristic flavor as well as healthy connotations for the consumer. The most tender part of the animal, because these muscles are used for posture, rather than locomotion. It is the cut most appreciated in fresh state. It is the most tender and most versatile piece. Its exquisite taste, rich in nutrient content and the low comparative ratio in fat, calories and cholesterol, make it an excellent choice. 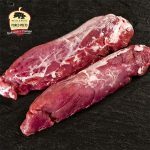 In particular, the pork loin is, after the a part of the animal with more protein and less fat, although you have to take into account how to cook it. 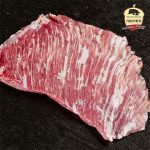 This highly marblde tasty cut is taken from a part that is hidden behind the shoulder. 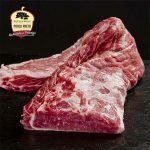 The word Secretos (Secret) is called as such because they were the pieces that butchers saved for their own consumption. 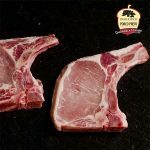 One of the most appreciated and recognized pork products in traditional cuisine are chops. 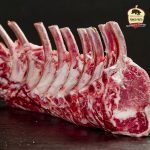 They correspond to the part of the sirloin and the back of the lumbar vertebrae attached to the bone.